I can now call myself a road cyclist. I am a Cyclist. Finally! I rode the Route du Fromage today in a beautiful boucle (circle) that included the Col d'Ichere and the Col de Marie Blanque. I know that bike rides in France such as the Col du Galibier and the Col du Tourmalet are legendary, and they are tough, but they are also doable. 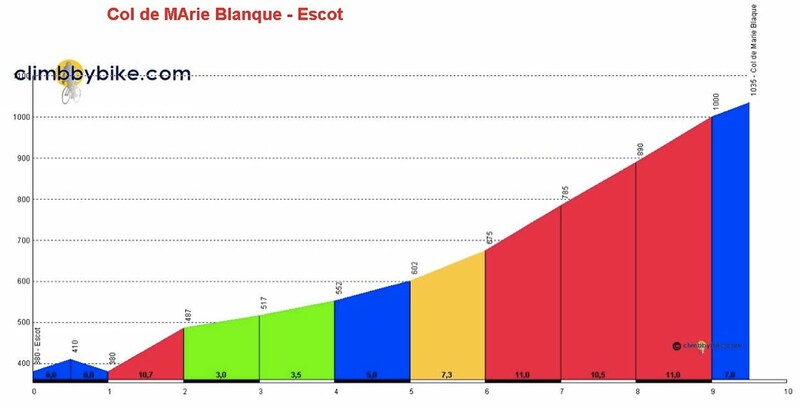 In my mind (and body) the Marie Blanque is one of the hardest climbs in the Pyrenees. I had to dig deep to get this climb done. The Col de Marie Blanque is included in Stage 17 of the 2010 Tour de France as one of the first climbs of a day that will see the riders finish on the Col du Tourmalet. If you will be riding in France and have an extra day, or perhaps you are wondering what to do on the Rest Day (the TDF rest day, not your own), try to squeeze in this ride. 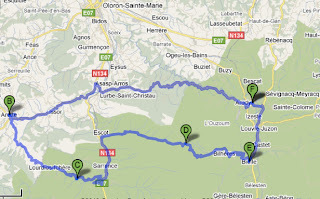 My ride today in France was an 83.1km loop from Arudy, to Assap-Arros, to Arette, over the Col d'Ichere (some gravel on the road), connecting to the Col de Marie Blanque, down into Bielle, and back to Arudy. Most of it was on white/green roads. Those are the wonderful white roads on the Michelin road maps that are highlighted in green to denote a beautiful route. It was indeed beautiful. I met some fun people out there today, one gentleman who shook his hand and proclaimed "oooo, tres difficile," when I told him I was heading to the Marie Blanque (he took my picture on the Col d'Ichere), and made sure I understood the route was 10-12% gradient and rode with me to the base of the climb. I met a biker and a hiker at the town water spicket prior to the ascent of the Marie Blanque, a nice couple who witnessed my arrival at the Col and cheered, a nice woman from Germany who was herself on vacation (she took my picture on the descent). Another nice man with a heavy country accent who teased me about the Americans being out of the World Cup. I also saw lots of cows, horses, a donkey, birds of prey, dogs, cats, and flys. No bear - they do have bear in this region, and wolf are beginning to spread through the Pyrenees again now that they are protected. I am quite tired after this ride today, it was HOT climbing, 24C at the farm right now at 6:00pm. I am so thrilled to have completed this climb. It is super hard (tres tres difficile). I cannot believe that the riders of the Tour de France will ride from Pau, over the Col de la Marie Blanque, down around the foothills, then up the long ascent through Ferrieres, to the Col du Soulour, down into the next valley, and then up the Col du Tourmalet. Come over here and try just one of these climbs in one day. You too will feel like a "cyclist". I'm not sure what that makes them? But I know I was dancing around happy at the top of that Col today. It was one of the reasons I had to return to the Pyrenees. In 2005 during the Etape du Tour I had to walk a small section of the climb, not today. Today I conquered the Marie Blanque!!!! The homes in this region, as I get closer to the Basque Country, have distinctive burnt sienna colored shutters. What a great idea! Baguette delivery, just in time for lunch. Views from my bike today (with very few cars on the road). The Col d'Ichere is a good warm up climb. This is the sign at the top. I didn't stop to take pictures of all the signs on the way up, because it was steep, and starting again when it is that steep is sort of tricky. the signs look just like the ones on the Col d'Ichere but basically they read 4%, 7%, 8%, 11%, 12%, 9.5%, 13% and then I needed to start ignoring them. The best news of the day is that just at the 13% sign, I discovered I was not yet in my 29 gear, yes, I can do this now I thought! They kind of got in my way. Just after the top of the Col, it does not descend immediately. There is a large plateau up on top of the Col de la Marie Blanque. My brother believes this plateau is one of the most beautiful places on earth. This is me again looking down on the Vallee d'Ossau and the town of Bielle. By now I am hot, tuckered, and hungry. The town of Bielle has a fabulous bakery (1 block up from the main road in the town square). The best pan chocolat I ever had. Lots of cyclists are passing through town right now as I sit and use the free wi-fi in the town center. Tomorrow I am going to search for a morning market. Now home to make another great meal and celebrate with a glass of local rose wine. Excellent.